On the last Friday of every month, Barbara Levin of Safety Chain, a leading provider of food safety and quality assurance automation and compliance solutions, hosts FSMA Fridays™ the leading online forum for the food and beverage community to learn the latest information about the FDA’s Food Safety Modernization Act (FSMA). 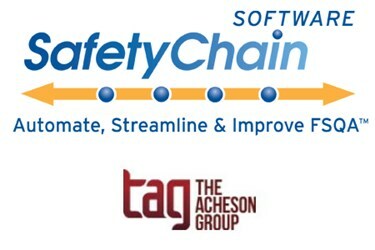 Featuring Dr. David Acheson, the popular monthly interactive pod/webcast is sponsored by SafetyChain Software and The Acheson Group. In the first portion of FSMA Fridays: The Food For Animals Rule, Safety Chain’s Barbara Levin discussed what food manufacturers are doing to comply with the current good manufacturing and hazard analysis and risk-based preventative controls for food for animals rule with the Acheson Group’s Jennifer McEntire and Ann Sherod. In part two, the panel examines what happens when the line between human food and food for animals becomes a bit blurry and what manufacturers and processors should be doing to prepare for the implementation of this rule. Barbara Levin: Jennifer, what if a facility handles human food, but some of the waste goes to animal feed? What happens when a human food company diverts to animal feed processing? Jennifer: Great questions! The FDA addressed this to some extent, recognizing that a lot of companies and facilities that are manufacturing primarily human food, or intend to manufacture human food, have occasions when some of this food may be diverted to an animal stream. For GMPs—which I feel like I’ve always referred to as the human food GMPs—the FDA is considering food when used there, in part 1.10, what's going to be part 1.17, that food could mean human food or it could mean animal food. If you're a facility that's currently in compliance with part 1.10 and will be in compliance with the new proposed 1.17 — the update to 1.10 — you would be all clear. If the food is produced under those conditions, that's food produced under GMPs, human or animal, you're all good. If you wanted to just use these new GMPs, the animal-specific GMPs, which, as Ann highlighted, are awfully similar to the ones already on the books for human food – a couple of minor differences — if you want to use those animal GMPs, you're fine either way. As a facility, you've got a choice, there is a little bit of flexibility there. There are, however, I think, some practical concerns and practical considerations when we look at what was supposed to be human food that perhaps didn't meet the quality standard. And there are some instances where that food maybe isn't produced under human GMPs, but currently is deemed to be perfectly acceptable as animal food; would it still be considered acceptable as animal food? I think there are some grey areas here, perhaps cases that the FDA hasn't fully considered, hasn't thought through, and that I would encourage the industry to make the FDA aware of. Instances where food has fallen on the floor — can it just be scooped up and go into a bucket for animal feed? Would that be considered under GMPs or not? If so, human GMPs or animal GMPs? How is the FDA going to view that? It's a question in my mind. Dr. David Acheson, Founder and CEO of The Acheson Group: I think Jennifer just raised what, to me, is a really important point that we need to be thinking about, and maybe focusing on in terms of comment, because trying to establish good manufacturing practices around food — and particular in this space of the human food going to animal feed, the waste stream — which, to a lot of companies, is actually valuable. There are important economic consequences around it. I'm struggling to get my head around, “How do you apply GMPs to a container of ‘human food waste’ going to animal feed?”, when ultimately that is going to get dumped in the back of a truck, driven to a farm, and then dumped into a pig sty or feeding cattle, which couldn't be further from any sort of good GMP concept, if you tried to get it further away. I think we've got some tough questions here and we may end up applying some fairly stringent requirements on the industry with economic consequence, which is just worthless in terms of actually protecting the health of the animals. I think the focus here may be much more on chemical imbalance and physical contaminants than it should be on anything microbiological, just because the physiology of an animal is so different. That makes a lot of sense because it could be quite impactful. Jennifer, I know you have encouraged folks to comment. Did I hear earlier that the comment period for this rule has been extended? Jennifer: Yes, it has been extended. It's now extended until March 31, coinciding with the deadline for comments for the intentional adulteration/food defense proposed rule. The extension gives people a little more time, a little more opportunity, to think about some of the issues. I, and the rest of our team, we always encourage people to make comments. If you don't read these issues with the FDA now, the FDA won't have the information to address these in finalizing the rule, and certainly we would want some of these points to be clarified before the rule is finalized. Ann, the FSMA comment periods are ending, implementation is quickly approaching, and we try to tell companies, “What should you start doing today to prepare for this rule?” Maybe you can give us some insight about this in regards to the animal rule? Ann: This is similar to all the other proposed rules that make notable changes around food safety proactivity in the industry. This particular rule has those new GMPs that we spoke about. Not only are there the GMPs that people might want to start preparing for, but there is also the food safety plan and all that it entails that we spoke about earlier. Food manufacturers and processors want to start developing, training, and implementing on these items so that when that final rule is out, you're not going to be on a really tight schedule to get all of these changes in. For the animal rule, we believe the effective date to be July 2015. What should processors and manufacturers be doing today? In my opinion, you make a plan. You identify and you dedicate those resources. You have to eat an elephant one bite at a time, you can’t swallow it whole. So, if you start developing your food safety plan — identifying hazards, determining what preventative controls are going to reduce those hazards, deciding how you will monitor them, having the proper validations and appropriate verifications, and make sure corrective actions are in place. Also, processors and manufacturers want to make the right decisions about those corrective actions. Proper documentation of everything is also essential. In the world of regulatory, if you did not document it, you did not do it. You want to make sure that you've got all of those things effectively taken care of ahead of time, so that you're not racing and trying to get everything to fit into a tight time frame. In FSMA Fridays: The Food For Animals Rule Part Three, Levin will invite the pod/webcast’s audience to ask questions regarding FSMA’s food for animals rule. The Acheson Group’s David Acheson, Jennifer McEntire, and Ann Sherod will address questions regarding companies that may receive exemptions, products that could be excluded from the rule, and problems that the new rule is fixing. Stay tuned. If you would like to attend FSMA Fridays, registration is free at www.fsmafridays.com. FSMA Fridays is a registered trademark of SafetyChain Software. Miss Part One of the series? Click here to check it out.